I learned today that UNI still makes a replacement filter for the VT500 Ascot & Shadow. I ordered one to replace my rotting filter. Can't wait till it arrives. Who did you order the filter from? I ordered directly from UNI. Usually they will try to refer you to a dealer in your area, but considering the age of the bike they sold me a filter directly. If you call UNI, ask for Roger. Don't know what to say about other sites. Just call Roger at UNI & order one. I just tried a search on Amazon.com using "UNI #NU-4072" as the search terms. It brought up several results. Well the UNI filter arrived today. That was a prompt response! It looks like there is some interchange with about 3 bikes. Other than that, it is simply a foam filter sleeve. Looks about the same size as a beer cozy. I will reply if anything out of the ordinary springs up, but I expect it to fit trouble free. Another option that I just learned about is this model of UNI filter for the 1985-86 Shadow. This filter looks to offer more volume & "should" flow more air than the 2-piece cage design. Just something to consider. I am now running an UNI filter for an '85-'86 Shadow. This appears to be an improved design from Honda originally. It's a one piece filter that replaces the Ascots 2 filter cages, filter element & the access panel. That's correct, the Shadow filter has the access panel attached to it & just slides into place. The filter element is much larger than the Ascots & is not much smaller around than the access hole itself. Below is a pic of the UNI Shadow filter. Both of these filters fit inside the factory air box. There is very little room under a VT Ascot fuel tank. There is a large common air intake plenum under the tank that takes up most of the room. I don't think your idea of hiding electrical components under the tank will work. Too bad I can't read the language in that link you posted. I wonder how well the bike ran after that modification. I removed my air box & placed a large UNI filter on the end of the common plenum. The bike wouldn't run worth a crap due to too much airflow. I've heard on another forum that those K&N type of filters that have the chrome end cap, can set up a bad resonance in the intake tract. I don't think that I would like having to pull the tank to clean the air filters. 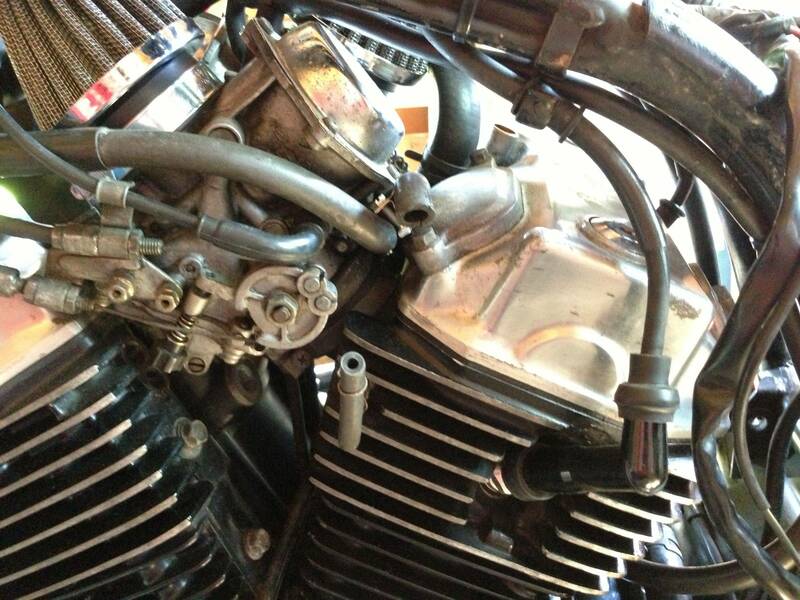 Just about anything you do to modify the intake will upset the jetting & the bike won't run throughout the full RPM range without bogging or choking at a certain RPM. Trust me... I usually have to learn the hard way. 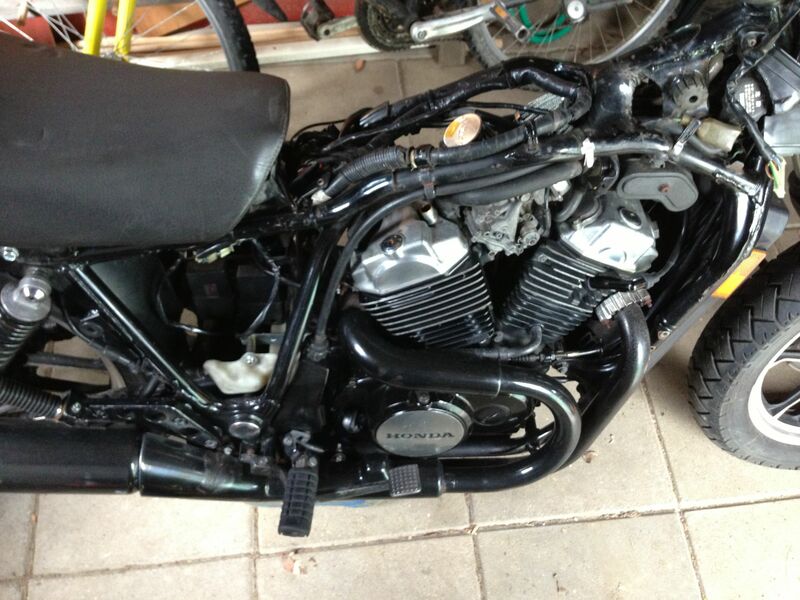 I've had my carbs apart about 5 times lately to change the jets & I need to do it again at least one more time. If you're looking for a place to hide the electricals. There is some room under the rear upper fender or tail-piece.